I've driven past this wood a ridiculous amount of times (it's on the way to the motorway from my house), but never stopped as it's a little hard to find somewhere to park up. This challenge provided the motivation I needed to check out the enticing bluebells. There's a path through the woods I was completely unaware of, and I'm very glad I checked it out, which is I guess the point of this challenge! I had no idea I lived so near somewhere so photogenic. The soft-focus effect was achieved with NeatImage. 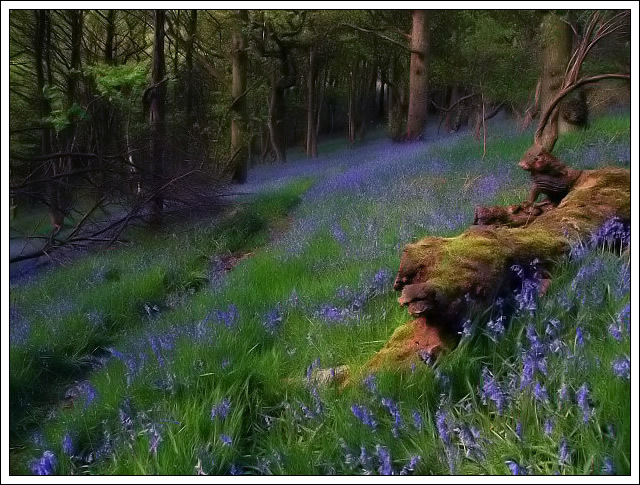 Almost nothing prettier than a bluebell wood. Absolutely gorgeous image. I love this. I can't believe I've never seen this. It is truly captivating. You think you are in another world! It has a sense of whimsy and the title is perfect for this fairy like setting. I feel like little gnomes and nymphs are hiding behind the trees. The depth of color is just beautiful. Great perspective too!! Awesome, man. This is really beautiful, but my eye is drawn to the one light spot in the forest. I am wondering if that was your intention here? It does make you look through the photo. This is a really neat shot. Reminds me of a dream or something that you would see on Lord of the Rings. Great job. Would have gotten a 10 from me too. this is lovely... I really like viewing it! lovely colors - tremendous shot. congrats!! Omg I see the animal spirits in the log! Its so obvious when its pointed out! Awesome man!!! Outstanding. Congratulations on the ribbon. Used NeatImage on entire image... I might put a tutorial on soon if I have the time and inclination. NeatImage is an excellent program used for reducing noise on digital photos. Particularly useful for shooting at high ISOs. Don't get too carried away with the NeatImage thing though... the original photo really isn't that far removed from what you see here! bob, did you use neatimage on the entire shot or on selections? Congratulations Bob an enchanting shot indeed, it reminds me of the film "What Dreams May Come", I'll be looking up "Neatimage" to see how I may enchant my own images. I am captivated by this beauty!!! Wonderful stuff, Bob! I love the softness and saturated colors. Congratulations on the ribbon! I love the work you did on this photo. The colors are great, and the softening made it a really magical image. It's bound to be a favorite with lots of people. Congrats! Congrats, Bob, on your first "Fluzi" win! Keep 'em coming. Very beautiful. I like the dreamy, almost silky appearance - makes a very sensual photograph. Congratulations! Congratulations!!! Beautiful shot. Great job. Thanks for all your votes and comments, much appreciated! Glad this shot ribboned, well done! This is awesome man, Congratulations! I liked this better than mine !! Well done Bob, flying the flag for the Brits! Apparently the UK harbours 20% of the world's bluebells. Lovely job. Beautiful! Magical I love bluebells! nice colour, the greens and the bluebells are so lovely. Well done! Congrats on your ribbon! Congratulations on getting 3rd with this beautiful photo. I gave this a 10. Message edited by author 2004-05-17 00:31:19. 10 from me (sorry about the typos in the challenge comment, I type faster when I am being effusive about something I really like). You just keep impressing me. Congrats! Congratulations. Fantastic image, well deserved ribbon! I love this a lot,gave it a 10. Congrats!! Wow, awesome shot. I love the neatimage effect. Great work. Very beautiful; I love the "darkness" of it, combined with the rich colors. It might have been nice to have some more of the tree tops/greenery though. I am in awe of how absolutely lovely all these purple flowers are and the way they merge together and form a misty purple sea towards the background...the colors in this are wonderful and I like the darkness...almost a painting....super! Message edited by author 2004-08-12 22:13:07. This is so Sidwell-esque. I think that's a compliment, too! :) I LOVE the soft focus and the UNBELIEVABLY dreamlike quality here. I'd love to know what the original looked like and how you PP'd it. 10. I absolutely love the ethereal quality you've given this scene with the focus and lighting that you chose. Beautiful picture. I like how the moss coverd log(?) in the right forground seems to have a couple of animal spirits hiding in it. I swear I see faces. A really good shot, I love the blue ground covering going off into the background. Looks dreamy. Wow!! Great composition and DOF. Good job. Wow...I expect woodland sprites and fairies to burst from the treeline at any second! Gorgeous colors and soft quality...love it!!! I like the soft look to this image. The colors are very rich and vibrant. This is a very lovely scene. Nice misty feel to the flowers. Really enjoyed it. beautiful! i love the view looking down the hill to the wonderful mass of flowers. looks like something from a storybook. well done! The leading lines are nicely done. I think that this photo should / will make you lots of money. This is just beautiful. Very surreal and beautiful. I love the mist of blue in the grass. I would have liked this a little bit brighter because it is sucha happy mood! Wonderful shot. Beautiful composition. Hapy memories for me growing up, a very different climate than here in Australia. I still miss bluebells. So sureal. Looks almost like digital art, not a photograph, amazing. Was there a filter applied to this to achieve this look? I like it though. Very sureal. This is exceptional and I certainly hope it does well in the challenge. The field of blue is technically beautifully done. Beautiful shot. Looks much like an illustration from a storybook. The green transitioning to blue is really well done. Looks like something from a romance novel. Sweet. Proudly hosted by Sargasso Networks. Current Server Time: 04/23/2019 08:36:01 AM EDT.